RCFF's 2018 annual family Warrengton, Virginia. RCFF's 2011 annual family photo Newark, Delaware. RCFF's 2012 annual family photo Manassa, Virginia. Students at Christian A. Richards Elementary School 2015. Christian A. Richards Elementary School running water. Christian A. Richards Elementary School students with new donated desks. !RCFF Receives 2018 Rev. Dr. Emmanuel Johnson Sr Award in Community Services! The Richards & Coleman Family Foundation, Inc. (RCFF) has been awarded the 2018 Rev. Dr. Emmanuel Johnson Sr. award for Community Service. The award was presented to the Foundation by Mrs. Mona Diggs on behalf of the B. W. Harris Aluminum Association D. C Metro Chapter on November 17, 2018 at the organization’s awards dinner and ball in Columbia, Maryland. 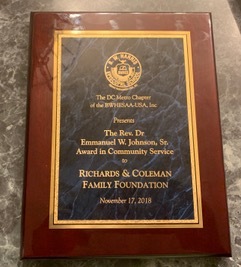 Mr. John Cassell, the Executive Director (ED) of RCFF received the award on behalf of the foundation and thanked the B. W. Harris Aluminum Association D. C Metro Chapter for the award. In his brief remarks, Mr. Cassell told those in attendance that the objective of the RCFF is to help educate the poor or needy children of Liberia and society as a whole. He emphasized that education is a means of relieving or eliminating ignorance, disease and poverty from society and humanity. The Executive Director informed the audience that the Foundation has provided assistance through the James D. Cassell Jr. and Rosalind Richards Educational funds to individuals and nonprofit educational institutions. 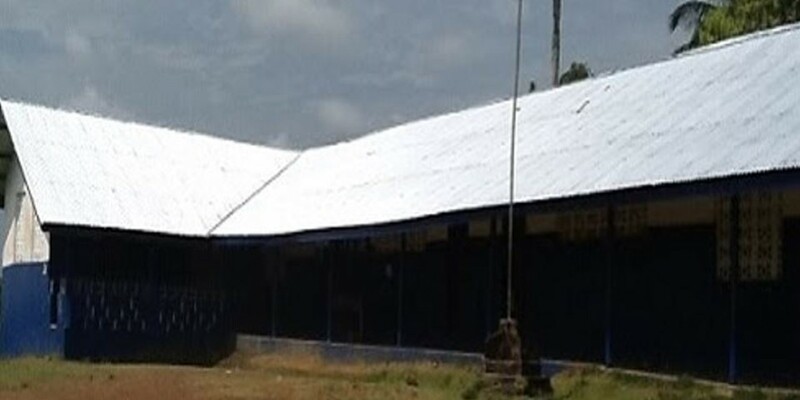 The ED also stated that RCFF has invested over $70,000.00 dollars in the Liberian educational system since 2013. The ED said that organizations in the US should continue to collaborate to support each other and the educational system in Liberia. He announced that the Foundation will provide scholarships to students at any educational institute in Liberia who meets the Foundation's published requirements. In 2018. RCFF awarded four $500.00 scholarships through the James D. Cassell Jr scholarship fund to students attending the B. W. Harris Episcopal High School. The ED thanked Ms. Gudrun Harris for serving on the Foundation’s Scholarship committee. The ED expressed thanks and appreciation to the officers and members of the Foundation present. He also thanked Ms. Cerue Darby, Ms. Mazu Cooper, and Mr. Handel K. C Diggs for serving as non-family members on Foundation’s executive board of director and for being present to receive the award. Members of the Foundation who were also present to represent the RCFF and receive the award were Mr. and Mrs. Richard Freeman, Mr. and Mrs. Ernest Claggett, Mr. Arnold Richards, Mrs. Jeannine Victor Toe, Mrs. Natalie Cassell, Ms. Ciatta Claggett and Mr. Varney Coleman. Pictures of the festivities can be viewed by clicking on this website's photo page. 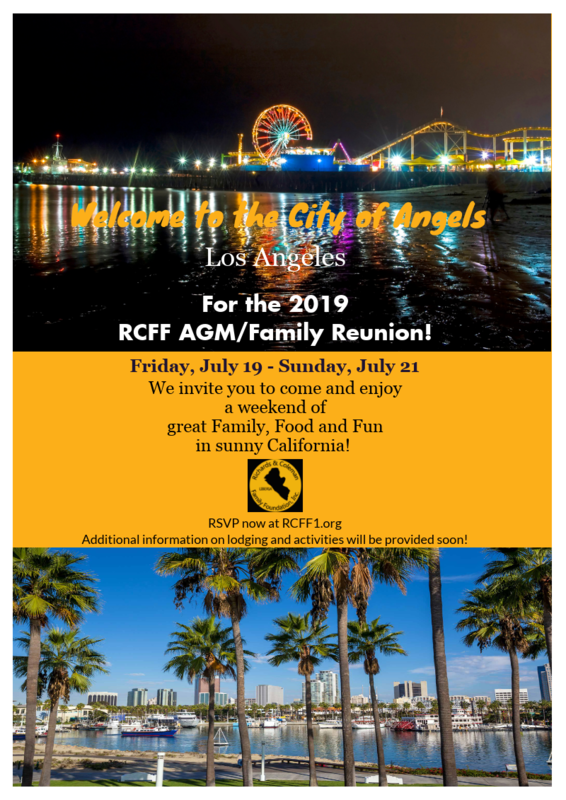 !RCFF's 2019 AGM/REUNION is bound for Los Angeles, California! First, on behalf of the RCFF Officers, Executive Board of Directors and members, we would like to express our heartfelt thanks and appreciation to all our family members and friends who helped to make our 2018 AGM/Reunion a success. A special thanks to those family members who paid their annual assessments even though they didn’t attend this year, and to those who worked tirelessly to ensure that everyone in attendance had a good time. During the Annual General Meeting the members of the foundation voted to host the 2019 AGM/Reunion in Los Angeles, California. Mrs. Gwendolyn Austin Collins will Chair the hosting committee to be assisted by Mr. Dwight Cassell as the Co-Chair. The activities will be hosted from Friday July 19th through Sunday July 21st 2019. In addition, the Executive Director is pleased to announce the formation of the RCFF’s James D. Cassell Jr. scholarship committee. The committee members consist of two family members and one non-family member. The two family members are Ms. Pereta Richards and Ms. Charmelia Richards. The non-family member is Ms. Gudrun Harris. The committee will select 10 people based on specific criteria to each receive a $500.00 scholarship for the 2018/2019 school year. Additional information about the scholarship can be found at RCFF's scholarship page. We sincerely thank the three committee members for their acceptance of these responsibilities. 1st prize - Ingrid Richards with a $50.00 Macy’s gift card 2nd prize - Arnold Richards with a $25.00 Apple gift card 3rd prize - Gerald Richards with 1 RCFF T-shirt 1 RCFF charger and 2 RCFF mugs. Congratulations to our winners!!! We will continue this membership assessment drawing moving forward, so all family members that pay their assessments on time have the opportunity to win next year-it could be you! Over the last three and a half years our Executive Director in coordination with the administrative officers and members of the executive board of directors, have been trying to create some benefits for the Foundation’s due paying members. Effective January 10, 2018, paid members will begin to receive the benefits below if or when their assessment is current for the year. All RCFF due paying members will be given a 10% discount to attend any paid RCFF sponsored event and to purchase items sold by the foundation unless otherwise announced. Members will also be given a 33% discount on the cost of the website’s family memorial page coming soon. One time legal business announcement which must meet or clear all ethical or moral standards. A three member committee will be established to review and approve all business announcements. All announcements must be approved by the Executive Director. To announce special events such as the birth of a child, graduation, wedding, etc. or to extend an invitation to all family members on the email distribution; no exception unless the member has opted out. The foundation will establish a raffle with 3 prizes with drawings to be held at the annual general meeting. All members who have paid their annual assessment by April 30th each year will automatically be entered into the raffle. The prizes will be announced on February 28, 2018. A 30-day banner advertisement will cost $75.00. The advertisement can include a link with additional information and/or can lead to an external website. A 30-day homepage side advertisement will cost is $50.00. The advertisement can include a link with additional information. A 30-day side advertisement on any of the website’s other pages will cost $25.00. The advertisement cannot include a link. RCFF reserves the right to refuse to run any advertisement that does not meet the organization’s ethical standards. The website’s memorial page is being finalized. As previously announced, you can memorialize your family member for $150.00. The first paid memorial page will be published soon. You will have the option to use a similar page design or design one of your own. The foundation’s members’ page is now ready for members to input or update their information 24/7 - this includes non-paying members. Go to www.rcff1.org/members to enter your data at any time. The Richards and Coleman Family Foundation, Inc. at its 6th annual general meeting weekend elected its officers for the next 2 years on Saturday, July 15, 2017. The officers were installed before the General Meeting by Mr. Jim Coleman, President and Chief Executive Officer at Prince George's County Economic Development Corporation. The installation was held on Sunday, July 16, 2017 at Argyle Park, located at 1030 Forest Glen Road, Silver Spring, MD. In attendance were 51 members, officers and members of the Board of Directors. The newly elected officers include Mr. Handel K. C. Diggs, who was elected as a member of the Foundation’s Executive Board of Directors. Other new officers elected were Mrs. Florence Thomas, Deputy Executive Director, Ms. Winnette D. Richards, Executive Secretary, Mr. Solomon Kpoto, Chaplin, Ms. Nicole von Ballmoos, Deputy Executive Secretary and Ms. Angelique M. Cassell, Deputy Director of Finance. Mrs. Rhonda Von Ballmoos was appointed Project Coordinator for Liberia by the Executive Director. The members also amended the constitution based on a recommendation of the executive board to lower the annual assessment fee for elderly members. Votes were taken to amend the constitution so that members 80 years and above would no longer pay assessment fees and members 70-79 years would pay $50 rather than $75. Votes were also to change the minimum age of assessment for children ages 3-18 years (formerly 3-21 in the constitution) to pay $10 and children 3 and under be free. The members also agreed to allow the administrative officers to decide and announce the Maryland site for hosting the 2018 annual general meeting by January 15, 2018. 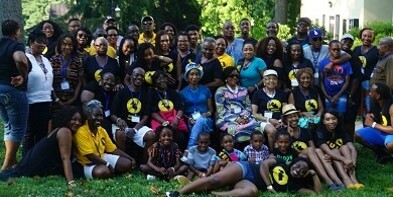 The Richards & Coleman Family Foundation, Inc. is hosting its 6th Annual General Meeting and 20th Family reunion on the weekend of July 14 through 16, 2017 in Silver Spring and Bowie, Maryland. The festivities will commence on Friday evening July 14th at the residence of Mr. & Mrs. B. Jefferson Herring, located at 2002 Del Sol Court Bowie, Maryland 20721 from 7 pm until midnight. The festivities on Saturday July 15th will be held at Argyle Park located at 1030 Forest Glen Road, Silver Spring, MD, US 20901 from 11:00 am to 9:30 pm. The activities at the park will include music, food, drinks and games. The election of the foundation's Executive Board of Directors and Administrative Officers will be conducted between 5 and 6 pm. The weekend will climax on Sunday with our Sunday Church Service at the United Baptist Church located at 14009 New Hampshire Avenue, Silver Spring, MD 20904 from 11:30 am to 1:30 pm to be followed by lunch and the Annual General Meeting at Argyle Park located at 1030 Forest Glen RD Silver Spring, MD, US 20901 from 2:00 pm to 5:30 pm. Directions and a schedule of the weekend's activities are being posted on the Foundation's website calendar page at www.rcff1.org/calendar where you can also pay your annual assessments. The schedule and activities are also posted on the Foundation's Facebook page where you can leave your comments. You can also email us your comments to the Foundation's email addresses rcff1@rcff.org or rcff@comcast.net. 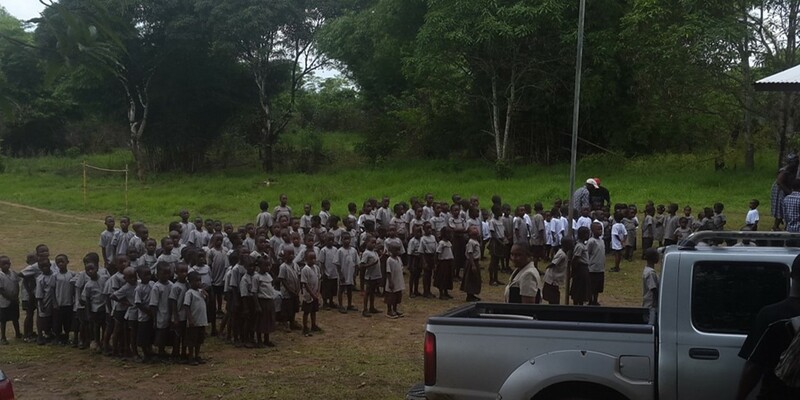 RCFF continues to support government and family-sponsored schools that are trying to educate the children of Liberia. We would appreciate prompt payment of assessments by family members to enable us to host the 2017 reunion activities and support the schools in Liberia. The family assessments, as established by the RCFF constitution, is $75 for family members 21 years and older and $10 for family members under 21 years. There is also a Guest assessment of $25.00. The assessments can be paid now, and we ask that all payments be made before July 14th. These payments can be made by: Checks payable to RCFF and mail to Post Office Box 2293 Montgomery Village, MD 20886 or to: Richards & Coleman Family Foundation, Inc.
OR just click on the following foundation's Online payment link: www.rcff1.org/paypal Cash payment made directly to the Director of Finance. Please do not mail cash. We look forward to seeing you during this year's RCFF Annual General Meeting weekend activities! 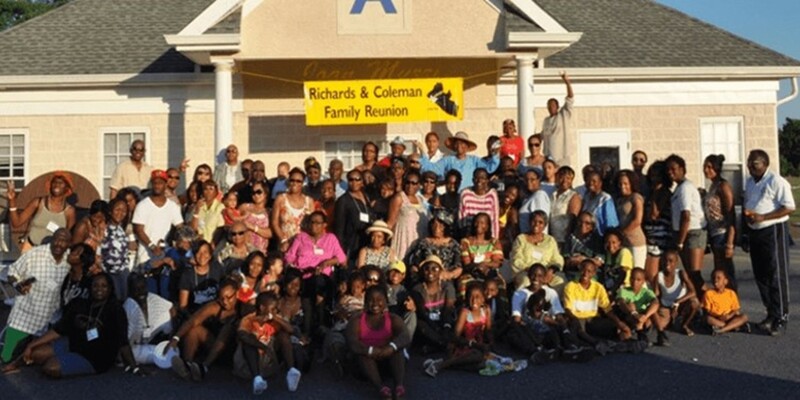 The Board of Directors and Officers of the Richards and Coleman Family Foundation, Inc. (RCFF) is pleased to announce that its 2016 Annual General Meeting(AGM)/Reunion will be held in Bowie, Maryland from July 15 through July 17 2016. More details of the weekend meeting activities will be in your email beginning May of 2016. This year the foundation is giving 30 RCFF polo shirts black or gold to the first 30 members who pays their annual assessment. Officers or members of the board are excluded from this offer. You can pay your assessment for this year and next year online 24/7.Just click on the following foundation's Online payment link www.rcff1.org/paypal. To qualify as a member, you don't have to attend the general meeting, you only need to pay your annual assessments for the current and previous years. You must also meet the family requirements. The foundation wants to remind our members as we approach the end of the tax year that all of their 2015 general meeting weekend expenses, hotel, car rental, and meals can be deducted from their 2015 federal tax return. Please be sure to keep your receipts for those items, the foundation only provides you with a receipt for your assessment and contributions made directly to the foundation. Consult your tax accountant about this information. Please don't forget to make your donation to the Christian A. Richards Elementary School water tower project by October 31st to help make this desperately needed project a reality. Give what you can afford regardless of the amount. For those in Liberia who want to donate to this project please contact Mrs. Rhonda Von Ballmoos at FIB, Liberia on Broad Street. Don't miss on this opportunity to help many young children in great need of a life sustaining resource. Resource that many take for granted. The Richards & Coleman Family Foundation's (RCFF) 2015 Annual General Meeting and family reunion is being held from July 17th through July 19th in the tri-city areas of Williamsburg, Newport News and Hampton, Virginia. Two years ago, the young adults of the family suggested this location, and it was approved by the general membership. The activities on Saturday, July 18th, are scheduled to be held at the Busch Gardens Park. More details and a schedule of the RCFF's 2015 Annual General Meeting weekend activities, can be viewed on the 2015 annual meeting link or the calendar page link in the menu section. This is an important year for the Foundation's future, as we will be electing new officers to run the Foundation for the next two years. Please use the Foundation's website @ www.rcff1.org/paypallink to pay your 2015 annual Membership Assessment, or mail it to the RCFF at P.O. Box 2293, Montgomery Village, MD 20886. The RCFF's Facebook page is another tool being used by the Foundation, which will enable our family to communicate important announcements about the family and the Foundation's activities. Through this medium, members are able to communicate openly with the Foundation about its functions. We want to remind everyone who uses this page that when posting; please communicate responsibly to have a positive impact on our family. The page can be accessed at facebook.com/pages/Richards-and-Coleman-Family-Foundation, Inc. The Foundation is currently also engaged in establishing rules or guidelines which will produce meaningful benefits for the Foundation's members. Membership requirements can be found at Constitution. More information on member's benefits, the General Meeting projects, and future events, will be announced before the General Meeting. Additionally, a new website is being developed for the Foundation, and will enable members to login to a database and vote on future elections, as well as other issues when they arise. Included on the new website will be some membership benefits as well. We look forward to seeing you in July. The Foundation has been working over the last year and a half, mostly through the generosity of the Roseline M. Richards Educational Fund to get the Christian A. Richards Elementary School in Clay-Ashland up and running. The City of Clay-Ashland and its environs demographically have a very high young population, as is the case all over Liberia. Pre-K through Kindergarten had about 240 children enrolled last school year not taking into consideration children in First through Sixth Grades. In our quest to assist the school system in Clay-Ashland, we contacted the Ministry of Education and were given the go ahead to renovate the Christian A. Richards Memorial Center for the purpose of moving the elementary school aged children from overcrowding at the William D. Coleman High School. As agreed by both parties, the Ministry of Education would provide the Administrative Staff and Teachers for the school and the Richards & Coleman Family Foundation would provide oversight and support to the school, designating it as a Public School. 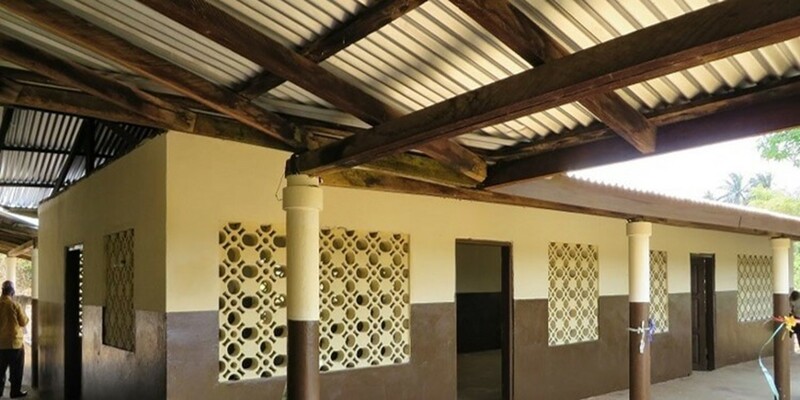 With the Elementary School's facilities now completed, due to some unforeseen events, we held meetings recently with a number of Deputy and Assistant Ministers and other staff at the Ministry of Education concerning the Minister's promise of their support for the school. From those meetings, it was clear that the Ministry of Education was not ready to work with us in the interest of the children of Clay-Ashland leaving us with no choice but to designate the Christian A. Richards Elementary School as a Private School. Needless to say, the day after our last meeting with the Ministry of Education, the entire top brass of that agency was changed by President Sirleaf. As the Christian A. Richards Elementary School has now been designated as a Private School, the parents will have to pay tuition fees for their children to attend the school, an option the parents chose after experiencing three weeks of instructional teaching since the school's reopening in March 2015. Although the parents who attended the PTA meeting opted to pay tuition fees, we know that there will be a number of those who cannot afford it. 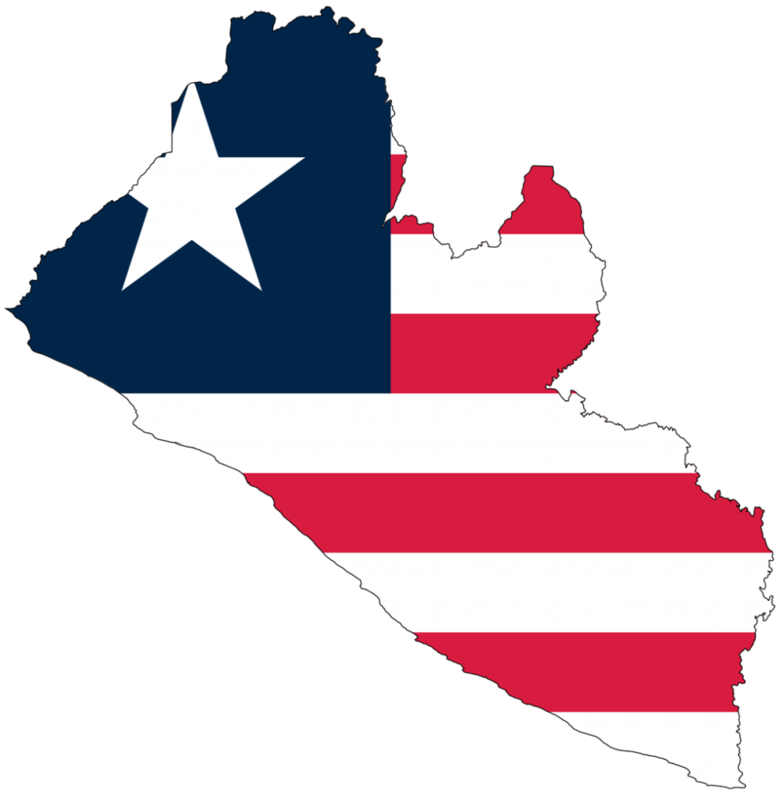 The fee as of May 2015 is $500 Liberian Dollars (about $7.00 USD) monthly per household. This is the minimal amount we believe would be needed to manage the school properly, taking into account staff salaries, school lunches and all other administrative costs to run the school. As a result, we are asking you to consider providing scholarships to deserving children who otherwise would be unable to obtain the quality education they deserve. Providing support for one child would cost $10.00 USD (Ten United States Dollars) per month; $120.00 annually. 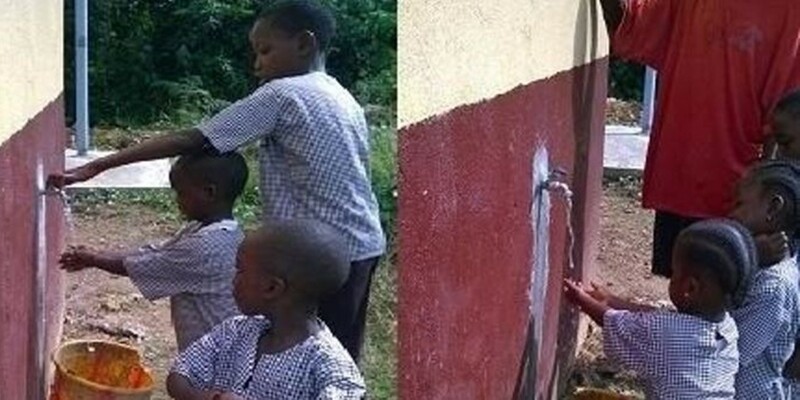 We are kindly asking you to consider supporting one or more of these children. If you are only able to provide assistance for a few months instead of a full year, that would also be appreciated. Donations can be made through the Richards & Coleman Family Foundation's website or by mail. Your help will bless these children in ways you cannot imagine and you too will be blessed in your giving. The Richards & Coleman Family Foundation's 2014 Honorees have been approved and officially notified by the Foundation of their selection to receive the Foundation's first honor for their contribution to our families and their work towards humanity. The honorees will be honored on November 29, 2014 at an official ceremony between the hours of 8 pm to 11 pm in Silver Spring, Maryland USA. The schedule, address and directions of the event can be found on the calendar page of the Foundation's website at www.rcff1.org. Admission is free for full family members, associate members and friends of the honorees. Please review the Foundation's constitution in reference to its membership classification on the about us link of the Foundation's website. The list of honorees are: Joseph G. Richards, Anna Sherman Richards, Eva Coleman George, Claudia Coleman Nelson, Olivia Coleman Banks, Paulita Coleman Padmore, Genevieve Coleman Garnett, Melvina Bendu Coleman, Moses O. Coleman, Vyrle Richards, Rev. Walter D. Richards, Louise Richards Morris, Robertetta Craig Burroughs, Ora Simpson Titus, Olive Simpson Akinsanya, Comfort Simpson Neal, Isabel Karnga Coleman, Mary Wesley Coleman, Joseph. K. L. Moulton, Rev. Mark Richards, Josephine Richards, Patience Matilda Railey and Violet Coleman Taylor. The official program on November 29th, two days after Thanksgiving, will feature the presentation of plaques, dinning, music, and other forms of entertainment. A silent auction and raffle in support of the Schools and the City of Clay Ashland's Health Care Center will also be held. For more information on this and other activities go to rcff1.org. The members of the Richards and Coleman Family Foundation, Inc. elected a new Board of Directors on Saturday July 19, 2014 during their annual general meeting weekend held in New Orleans, Louisiana. The members elected to the RCFF board are Dr. James N. Garnett Jr, Mr. John D. Coleman, Mr. Jefferson Herring, Mrs. Willametta Tillman, and Mr. Othello Richards. Ms. Liza Brisbane was elected to the board as a non-family member. There are three non-family member vacancies on the board that needs to be filled. Mrs. Kathleen Coleman Foster administered the oath of office to the board members. Mr. Othello Richards who is not seen in the photo displayed was sworn in by stood proxy. The administrative officers will recommend three candidates to fill these positions at the 2015 general meeting. The new Board members will serve a one-year term. The foundation's constitution states all elected officers shall be elected every two years. The Administrative officers and board of Directors are scheduled to be elected at the foundation's 2015 general meeting scheduled to be held in Williamsburg, VA to serve a two-year term. The members of the foundation approved amendments to the constitution as recommended by the board of directors and administrative officers with some revisions to the document as presented. The Executive Director of the Foundation assured members that by amending the constitution, the officers will be able to create and implement policies to fully operate and provide enormous benefits to the foundation and its members. Mr. Cassell disclosed that the foundation will begin implementing these amendments immediately by providing lower costs to members who have paid their assessments for the year 2014. Beginning in 2015 the benefits will apply to members who are current for the last two years. The Foundation's new website and database which is under development, will include a membership database which will enable members to access reduced prices for upcoming Foundation events. Associate members and the general public will not be able to access these discounts. Mr. Cassell also disclosed that the foundation will begin using in-kind support in its operating budget. This will help when seeking professional services as needed by the Foundation. RCFF's 2019 Annual General Meeting/Reunion!